In February 2010, a salvage excavation was conducted near Bar Ilan Street in Ramla (Permit No. A-5837; map ref. 187304–38/648766–804), prior to construction. 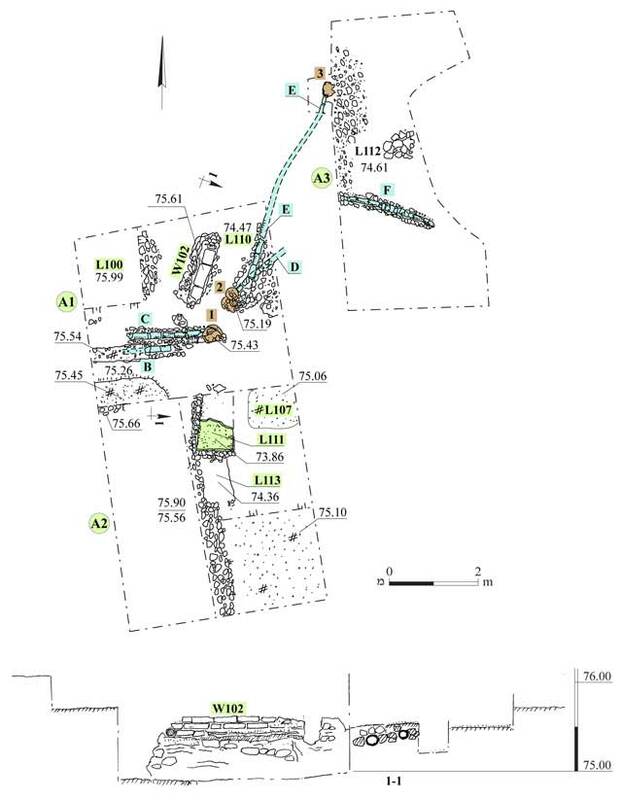 The excavation, undertaken on behalf of the Israel Antiquities Authority and financed by the Ramla municipality, was directed by I. Kornfeld, with the assistance of E. Bachar (administration), C. Ben-Ari (GPS), A. Peretz (field photography), A. Hajian, T. Kornfeld and M. Kunin (surveying and drafting), N. Zak (plans) , M. Shuiskaya (pottery drawing), A. Ganor (glass restoration), C. Hersch (glass drawing), C. Amit (studio photography), A. Berman (numismatics), Y. Gorin-Rosen (glass) and A. Bouchenino (ceramics). Two excavations were previously conducted in the immediate vicinity: one yielded refuse pits with pottery and glass debris dating to the Abbasid period (Haddad 2011); the other—architectural remains, floors cisterns and an installation dating to the Abbasid and Fatimid periods were revealed (Toueg 2011; see references therein citing additional excavations carried out in the surrounding area). Three squares (A1–A3; Fig. 1) were excavated, exposing an early and a late stratum dating to the Early Islamic period. A water system was unearthed in the early stratum, and the late stratum yielded pits containing pottery sherds. These layers were overlain with floors that could not be dated with certainty. Square A1. A system of four pipes (B–E; Figs. 2–5) and two jar installations (1, 2) was exposed. Pipe B (length 2.2 m) was encased within small fieldstones bonded with mortar; it was severed in the east, probably the result of a later disturbance. Pipe C (length c. 1.6 m) ran parallel to Pipe B and connected to Installation 1. At the base of the installation was a fragment of a jar, atop of which lay another jar. Installation 2 was composed of four connected jars, bonded with fieldstones and mortar. Several pipes that were attached with mortar to the jar rims and served to convey liquids were identified when the installation was dismantled. Pipes D and E were connected to the upper jars in Installation 2, and liquid flowed down from them by means of gravity. Near the installation was a fals that was struck at the Ramla mint of the Abbasid governor Ja‘afar (L110; 846/7 CE; IAA 139195). A wall (W102; Fig. 6) built of ceramic bricks founded on fieldstones bonded in mortar, possibly the remains of another installation, was found near Installation 2. No architectural connection was detected between W102 and Installations 1 and 2. A layer of hydraulic plaster was exposed on the western side face of the wall; the function of the plaster is unclear. Just north of the wall was what looked as either a pipe section or a saqiye vessel; it may have been linked with upper-level pipes, which did not survive. Square A2. Several plaster floors were exposed; the lowest one (L107) abutted a rectangular settling pool (L111; Fig. 7), whose upper part was destroyed by later disturbances. Remains of a vault were exposed in the pool’s southwestern corner, and an opening was revealed slightly below it (depth 0.8 m). 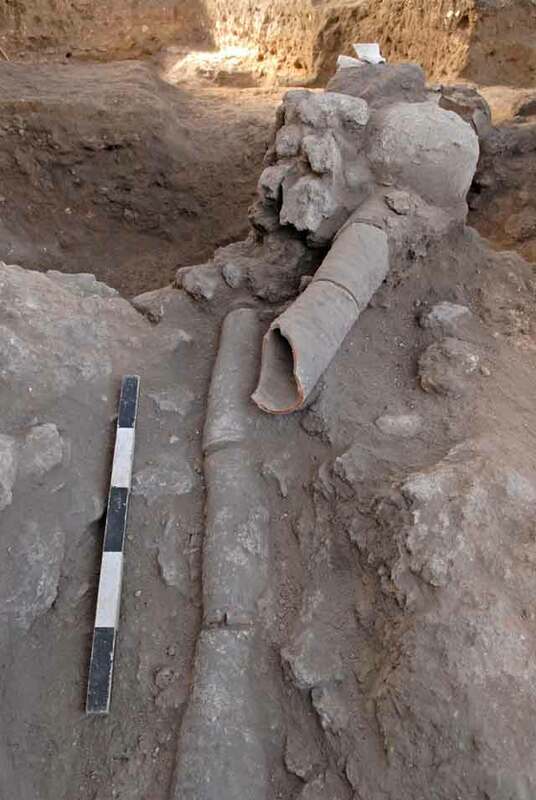 In addition, a terra-cotta pipe with a perforation at its end was identified; it might have been used in draining liquids into the pool or as part of a southern pipeline that did not survive. Square A3. After the topsoil accumulation was cleared by mechanical equipment, the continuation of Pipe E was exposed at a lower level. The pipe was connected to a jar (3; Fig. 8) that set on a bedding of fieldstones bonded with mortar. 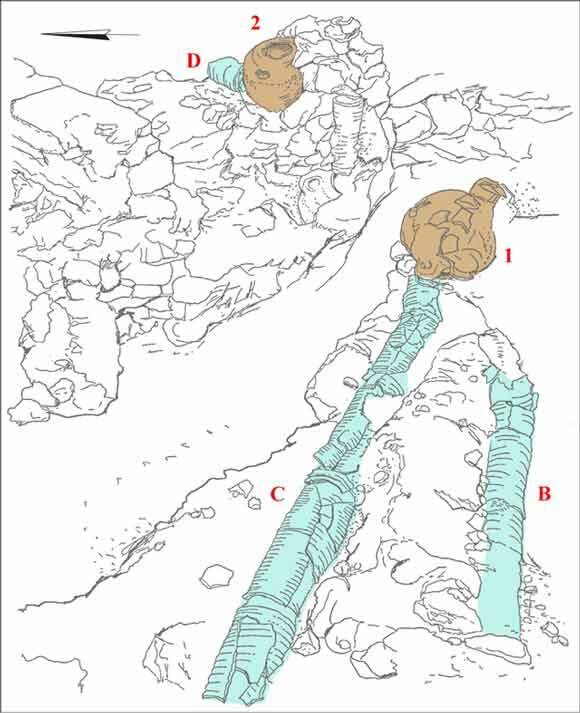 The route of another pipe (F; Fig. 9), which, like Pipe B, was enclosed in fieldstones and mortar, was exposed to the south. Numerous sherds, mainly from the Abbasid period (ninth-tenth centuries CE), were found. These included a common glazed bowl made of buff ware and decorated with glazing, with a thick wall and a carinated base (10:1); a bowl with a short, everted ledge rim (Fig. 10:2); a small bowl with an everted rim (Fig. 10:3); a hemispheric bowl with an inverted rim (Fig. 10:4); kraters (Fig. 10:5–7) decorated with wavy and straight combed lines, one of which (7) had two vertical handles; a very common type of krater with a thickened folded-out rim (Fig. 10:8); a krater made of buff ware with an everted rim (Fig. 10:9); a Gaza jar (Late Type 4; Majcherek 1995:169–170) that was used until the beginning of the ninth century CE (Fig. 10:10, 11); and a zir jar (Fig. 10:12) with a thickened and slightly everted rim. This zir jar is common in Ramla and its vicinity and is prevalent in Early Islamic pottery assemblages. It apparently originated in or near Jerusalem and dates from the late seventh century to the tenth century CE; in Ramla it appeared with the founding of the city in the early eighth century CE. The assemblage also included a very common type of stopper (Fig. 10:13) and jugs made of buff ware that first occurred in the Abbasid period and continued until the eleventh century CE (Fig. 11:1–6); some of the jugs had engraved decorations and plastic additions (e.g. Jug 5), and one sherd with a handle belonged to a large specimen (No. 4; Avissar 2007: Fig. 2:19). Also found were pomegranate-shaped vessels (Fig. 11:7–10) of unclear function, which were common throughout Israel in the Early Islamic period; mold-made lamps of buff ware (Fig. 11:11–13), including almond-shaped lamps with a tongue handle adorned with clusters of grapes and tendrils, which are widely distributed and date to the ninth–eleventh centuries CE; a section of a terra-cotta pipe (Fig. 11:14), which was an important element in supplying water to the city of Ramla; kiln wedges (Fig. 11:15–17) used to separate pottery vessels during firing; and a zoomorphic vessel (Fig. 11:18), the likes of which first appeared in the Umayyad period and were used in decanting liquids. Seventy-five glass items were found, of which twenty-five are debris related to glass industry, including fragments clearly indicative of glass blowing that was done in the immediate vicinity. 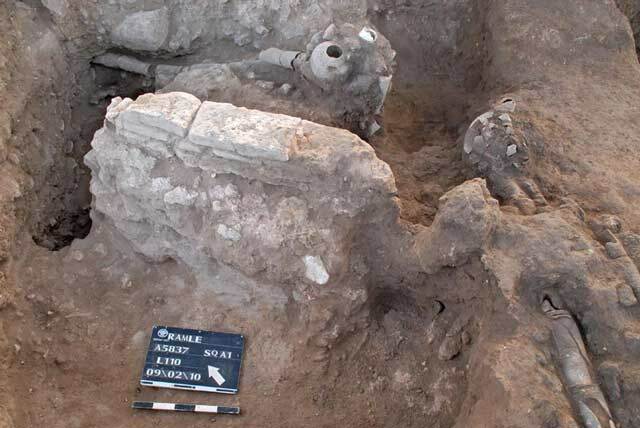 Besides the waste glass, vessels dating to the Early Islamic period were found. These represent known types from the eighth century to the beginning of the eleventh century CE. Most of the vessels and the industrial waste were found in L100 (Figs. 12:6–9, 11; 13:1–8) and in L110 (Fig. 13:11, 12). A decorated vessel was found in L111 (Fig. 12:12), and six vessels (Fig. 12:1–5, 10) were found in L113. Glass Vessels (Fig. 12). 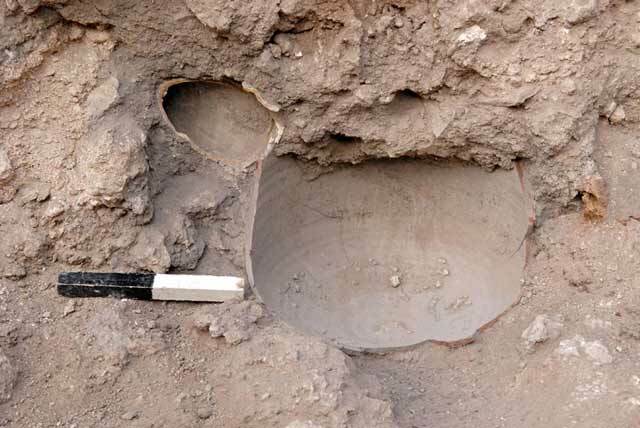 Two sub-types of cylindrical bowls characteristic of the Abbasid period were found. Bowl 1, representing the first subtypes, is made of greenish blue glass; it is a shallow cylinder with a relatively thick wall and a flat base with a coarse scar at the bottom. The second subtype, represented by Bowl 2, is made of colorless glass with a brown-yellowish tinge; this bowl is wider but of similar height, its wall is thin and the base is slightly concave. The quality of the glass of both bowls is very typical of Abbasid-period vessels. A specimen similar to Bowl 1 was found in a nearby excavation in Ramla (Gorin-Rosen 2011a: Fig. 16:1). Bowl 3 is made of greenish blue glass and is adorned with a pinched decoration that created an elliptical pattern below an everted and rounded rim. Bowls decorated with a tong-pinched pattern are very typical of glass assemblages from the Abbasid period; however, this type first appeared in the Umayyad period, and fragments decorated in this technique were found in several assemblages that date to the first half of the eighth century CE. Bowl 3 was found along with Bottles 4 and 5. The bottles represent the most common types in the eighth and ninth centuries CE, and they were probably produced locally. Both bottles are greenish blue in shade. Bottle 4 has a flattened, folded-out rim and a short wide neck; Bottle 5 has four horizontal pinched ridges on its neck. Bottles 6 and 7 are haphazardly made and their rims are folded inward. Bottle 6 has a short, wide neck and is asymmetrical. Bottle 7 has a narrow neck that opens to a sloping, asymmetrical shoulder. Both bottles were produced in a local workshop, probably the one whose remains were found at the site. Bottles that are almost identical were found in a nearby excavation in Ramla (Gorin-Rosen 2011a: Fig. 14:4–6) and date to the eighth century CE. Also belonging to the group of early vessels, dating from the eighth century CE, is a neck fragment (No. 8), made of greenish blue glass and adorned with a delicate wavy trail. This vessel was found together with Bottle 7 and the base of Bottle 9. Bottle 9 is a small, cylindrical vessel made of colorless glass. The fragment of Vessel 10 belongs to a small bottle and is square in cross-section; it is massive and has a thick wall and a very thick base. The glass, which is green-blue in shade, is pitted with severe weathering. The bottle was used for cosmetics and is very typical of the ninth-tenth centuries CE. Vessels 11 and 12 exhibit a variety of decoration techniques. Bowl 11 was mold blown, forming a relief. 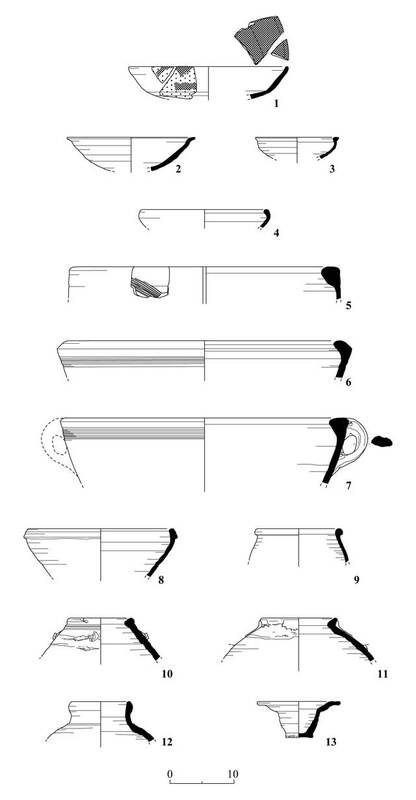 The bowl has an everted wall and is decorated with a design that begins at its base and continues up the wall; the decoration on the wall is composed of transverse rhombuses. Bowls of this type are known from other excavations in Ramla and elsewhere, and date mainly to the tenth – early eleventh centuries CE. Many such bowls were found on the Serçe Limani shipwreck, which sank off the Turkish coast in 1025 CE. The decoration on Vessel 12 was carved and polished after the glass had cooled. As this technique requires both time and a great amount of skill, vessels produced in this manner are considered luxury items. Nevertheless, this decoration technique appeared on pottery sherds found in excavations throughout Ramla. They belong to a wide variety of vessel forms and exhibit a variety of motifs (e.g., Gorin-Rosen 2011a: Fig. 16:5, 6; Gorin-Rosen 2010:248–252, Pl. 10.10:2–8). The walls and bottom part of the vessel are decorated with a deeply carved design. The base of the vessel is adorned with circles and the wall is decorated with elliptical grooves in a vertical line that reaches the base. There are two deep horizontal stripes above the grooves. The decoration likely extended upward, but the vessel was broken and only its lower part survived. The workmanship and pattern are indicative of a luxurious and quality vessel requiring time and effort, as well as considerable artistic ability on the part of the craftsman. A similar vessel was found at Nishapur and is dated to the tenth century CE (Kröger 1995:124–125, No. 167, and see other references therein). Another similar vessel found at Fustat and decorated with carved grooves and deeper carving in their center dates to the tenth century CE as well (Scanlon and Pinder-Wilson 2001:92, 99, Fig. 42-z”). Industrial Glass Waste (Fig. 13). A variety of waste related to a glass workshop was found. Although the location of the glass kiln was not identified, the finds indicate it was situated very near the excavated area. Moil—waste produced from glass blowing—is the leftover glass that remains after the vessel is severed from the blowpipe; one side is neatly cut from the neck of the vessel, and the other side is broken off from the end of the blowpipe. Two moil fragments were found together with other types of waste. One moil (Fig. 13:1) is very thick, colorless and covered with hard, black pitted weathering. It is apparent from the fragment that the glass was wrapped in several layers around the blowpipe; the detachment of the vessel from the pontil rod is clearly evident in the fragment’s cross-section. The second moil (Fig. 13:2) is broken, and only the severed end survived. It probably came from a colorless vessel, and is covered with black weathering. The quality of the material and the weathering indicate that the glass does not predate the Abbasid period. The largest number of moil fragments from excavations in the Ramla area was found in the remains of a workshop at Mazliah (designated Ramla [South]), although these were earlier, and date to the Late Byzantine period, as evident in the quality of the glass from which they were produced (Tal, Jackson-Tall and Freestone 2008: Fig. 8). Another waste fragment is a pendant (Fig.13:3) that has one round end that is broken and one pointed end. It is also evident that the fragment is made of glass that is not homogenous and contains bits of red glass formed by concentrations of copper. Small lumps of raw glass covered with severe weathering, such as a small chunk (Fig. 13:4) that is triangular in section, were also found. Other examples of industrial waste that were found include a lump of hot glass that cooled (Fig. 13:5), a lump of mixed waste from a kiln (Fig. 13:6) and a lump of glass that remained at a high temperature for a long time, and all its edges are curved (Fig. 13:7). Fragments of bricks used in the kiln were found (Fig. 13:8–12). These included a glazed brick fragment from the kiln’s inner lining; the glazing resulted from exposure to the heat within the kiln. The outer lining of the kiln, also made of brick material, remained unmodified, leaving the texture of the organic temper visible. Brick fragments that were glazed at different levels of temperature were identified; these had an inner glazed face that was burnt at a high temperature, as indicated by visible hollows where the organic material had completely burned away, and an outer face. In addition, fragments of kiln bricks were found (not photographed). Another type of waste, characteristic of the area closer to where the glass was melted within the kiln, is the wall remains that are partially covered with glaze and have remains of raw glass on their edges (Fig. 13:13). 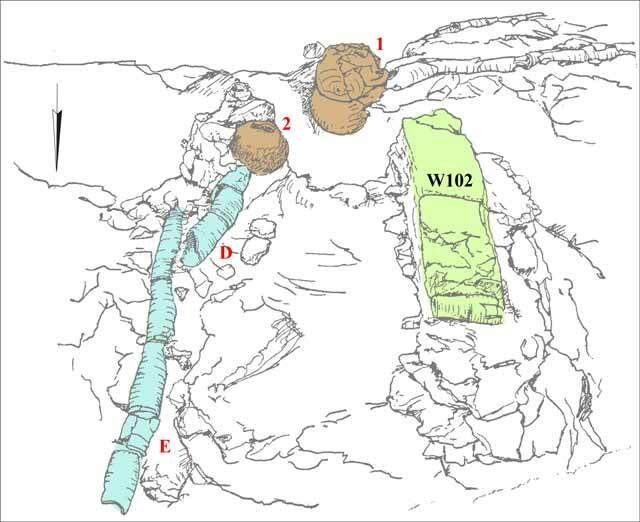 Similar remains of burnt and glazed bricks were found within the debris of the Late Byzantine-period workshop at Mazliah (Ramla [South]; Tal, Jackson-Tal and Freestone 2008: Fig. 1). 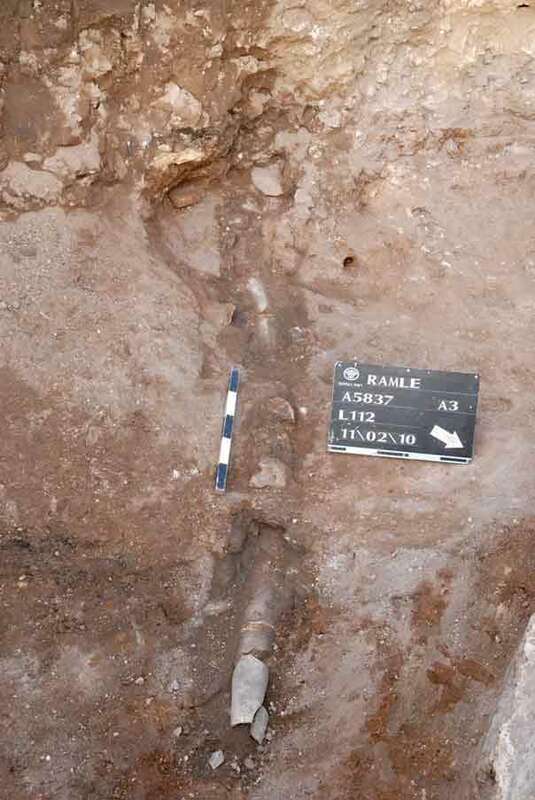 Industrial glass waste was also found near the surface in an excavation on Bar Ilan Street in Ramla, along with finds dated to the Umayyad, Abbasid and Fatimid periods (Gorin-Rosen 2011b), and in refuse pits found nearby, along with pottery-kiln debris from the tenth–eleventh centuries CE (Gorin-Rosen 2011a). It is important to note the proximity of the pottery workshops to the glass workshops; this phenomenon is known from other industrial regions from this period as well as from earlier ones. The excavation finds are indicative of an industrial region where there was a complex, gravity operated water system. 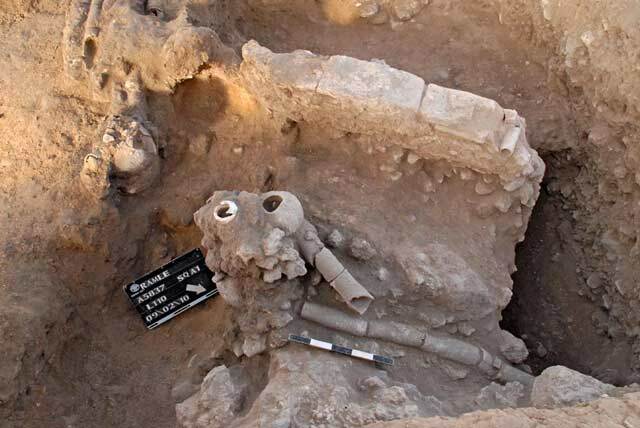 Given the finds from this excavation and others conducted nearby, the remains were dated to the Abbasid period. The installations could have been used for thermal insulation, and may have heated the water that flew through them. It was impossible to connect all of the excavated elements into a coherent plan due to later disturbances, probably dating from the second half of the ninth century and the tenth century CE. Refuse pits for pottery vessels, as well as kiln wedges and glass vessels, belong this period. The pits penetrated the earlier phase and damaged the jar installation, thus making it difficult to understand how it operated. 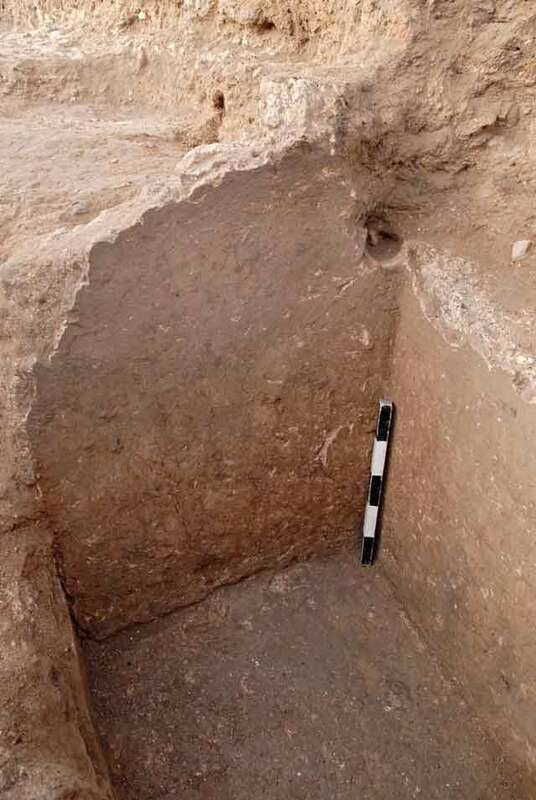 Nevertheless, one can see the correspondence between these finds and those of a nearby excavation (Haddad 2011), where a refuge dump containing kiln waste from a pottery workshop dating to the Abbasid and Fatimid periods was exposed. The entire area, comprising a wide variety of manufacturing installations, was used for industry. Avissar M. 2007. Ramla, David Razi’el Street. HA-ESI 119. Gorin-Rosen Y. 2011a. The Glass. In E. Haddad. Ramla, Ha-Nevi’im Nursery School. HA-ESI 123. Gorin-Rosen Y. 2011b. The Glass. In R. Toueg. Ramla, Bar Ilan Street. HA-ESI 123. Haddad E. 2011. Ramla, Ha-Nevi’im Nursery School. HA-ESI 123. Majcherek G. 1995. Gazan Amphorae: Typology Reconsidered. In H. Meyza and J. Młynarczyk eds. Hellenistic and Roman Pottery in the Eastern Mediterranean—Advances in Scientific Studies (Acts of the II Nieborów Pottery Workshop; Nieborów, 18–20 December 1993). Warsaw. Pp. 163–178. Scanlon G.T. and Pinder-Wilson R. 2001. Fustat Glass of the Early Islamic Period: Finds Excavated by the American Research Center in Egypt 1964–1980. London. Toueg R. 2011. Ramla, Bar Ilan Street. HA-ESI 123. 2. Square A1, looking east, drawing. 3. Square A1, looking south, drawing. 4. Square A1, looking west. 5. Square A1, looking west. 6. Square A1, Wall 102, looking northeast. 7. Square A2, plastered pool, looking south. 8. Square A3, Jar 3, looking west. 9. Square A3, Pipe F, looking west. 10. Pottery: bowls, kraters and jars. 11. Pottery: jugs, juglets, lamps, a water pipe, kiln wedges and a zoomorphic vessel.